This is precision zinc plated long steel shaft/axle for an Israel Customer. under the process of initial turning, static balancing, welding&assembly, fine turning, grinding and dynamic balancing etc. 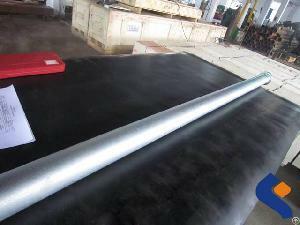 Usually the roller has critical requirements on the roundness, straightness, runout, con-centricity and cylindricity - that's why final precision grinding process is a must for a qualified steel shaft/axle. We are apponited supplier by many famous companies such as Hewlett Packard in large digital printing rollers, Andritz in paper mills rollers, and RPA in big mine steel drums/ pulleys/ rollers. As an experienced custom roller provider, we are looking forward to be your subcontractors or OEM as long-term cooperating partners. We promise to offer the parts with high-level quality, delivery on time and competitive price. Please feel free to contact us for any further questions or drawings for quote.